Marriage is one of the most important days in a person’s life. Selecting a good date and time for your wedding minimizes future marital problems and conflicts between you and your spouse. Sometimes, in the event that a couple’s Bazi Chart suggests incompatibility, a carefully selected date can help to minimize or negate this incompatibility. 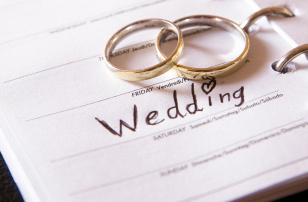 You can rely on our professional service for a meticulous selection of wedding dates for you and your partner. We do not just select a general Tong Shu good date for your wedding. This is insufficient. We take into consideration your Bazi Destiny Chart to ensure that the date selected do not clash to both your Bazi as well as your parents. We will then go even deeper to personalise the date selected to ensure that this date is beneficial for both of you according to your Bazi Chart. This is important as a general auspicious date listed in the Tong Shu can still turn out to be a bad date if the date and your Bazi Destiny Chart are not compatible. The timing to carry out all the key activities on your wedding day is also very important. An auspicious date without an auspicious time is as good as none! If an inauspicious timing is used, it may render the auspiciousness of the day useless, even if it is a good day. We will select a list of auspicious timings within each selected date for your ROM and Customary Wedding. Only in this manner can you truly qualify a good day that can be used for your wedding. All the selected auspicious date and time will be printed on a professionally produced report and organized in such a way that it is easy for you to read and understand with zero effort. We will also explain to you all the Chinese wedding customs and traditions so that at the end of the consultation, you know exactly what to do for your wedding. A “Chinese Wedding Customs and Traditions” guide will also be given to you so that you have all the information on hand without fear of forgetting anything and there is no need to copy anything during the session. What makes us different from the rest is that we are able to calculate wedding dates for any year, month and day, without the need to wait for the Tong Shu to be published. This allows you to beat the crowd, book your dream wedding venue and secure popular wedding dates way ahead of the rest. In addition, in the event if the given dates are not available in your preferred venue, we will reselect for you free of charge with no additional charges.